Love conquers all is a theme at least as old as Shakespeare, but in the last fifty years, it has rarely been explored in the context of horror films. Let the Right One In's singular accomplishment is that it captivates us with a fresh take on this venerable theme while simultaneously upending horror genre conventions at every turn. The memorable end result resonates long after the final credits. Oskar is a bright but friendless 12-year-old living in the suburban town of Blackeberg, Sweden, circa 1982. He is a passive target of the school bullies and, when alone, acts out violent revenge fantasies using a knife that he keeps hidden under his bed. Hope arrives when the apparently like-aged Eli, along with a middle aged male guardian named Hakan, move in to Oskar's apartment building. Oskar and Eli begin a complicated relationship, one made more so by the fact that Eli is a vampire. Events transpire that put that relationship and Oskar and Eli themselves at mortal risk. 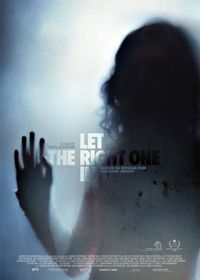 John Ajvide Lindqvist adapted Let the Right One In for the screen from his 2004 novel. The original story includes little traditional vampire lore. There are no fangs, crucifixes, or garlic on display. The only nods in that direction are the deadly effects of sunlight and that a vampire can only cross a threshold by invitation. These elements remain in the film but Lindqvist's screenplay, with input from director Tomas Alfredson, sharpens the focus of the story for the movie by emphasizing his novel's strongest asset, the unusual relationship of Oskar and Eli. Alfredson's unconventional stylistic touches inhabit the entire film. Most modern horror movies portray action scenes by building tension using the point of view of the potential victim or by inviting the audience to share the perspective of the monster/assailant. Alfredson employs a naturalistic approach that works differently. In the first attacks by Hakan and Eli the camera appears to be placed in a single spot rather far from the action. In the theater where I first saw the film I could feel myself moving forward in my seat trying to get a better look. We are shown the onset of each attack from a distance. After capturing our attention completely, Alfredson unnerves us with a closer view of the horror that follows. His camera is calm and observant, whether Hakan is draining blood from his victim into a plastic jug or Eli is nourishing herself from a fresh kill. A remarkable departure from this visual approach comes in a cleverly staged set piece, Oskar's final confrontation with his enemies. I won't spoil it, but the action occurs while Oskar is being held underwater in the gym pool by the sadistic older brother of one of the school bullies. The camera is trained on the submerged Oskar beneath the surface of the water. The action happens outside of the pool but Alfredson is able to present the climax without the "monster" on screen and still make it completely satisfying. Discussing the ways LTROI defies convention demands a special mention of the haunting and beautiful score composed by Johan Soderqvist. Alternating between somber orchestral settings and pieces for piano or guitar he evokes longing and the bittersweet feeling of first love as well as providing compelling back drops for some of the violence in the story. Without resorting to Psycho-like shrieks or pulse pounding percussion he is in perfect emotional sync with Alfredson's vision. To fully realize that vision Alfredson must take on the challenges inherent in presenting two most complex protagonists. Alfredson knows that for the storyline of the film to work we must believe that Oskar and Eli are acting like real 12 year olds. But we must also believe that they are capable of a relationship that transcends friendship and romance, that they are soul mates. By his choice of Kare Hedebrant as Oskar and Lina Leandersson as Eli, Alfredson doesn't just succeed. He knocks it out of the park. Oskar is basically a sweet hearted kid. But he is also at times childishly insensitive. His custody is shared between his nervously hovering Mom who he barely tolerates and his Dad whose attention he craves so much that any wavering is taken as a hurtful insult. He has major anger issues as seen by the revenge fantasies and he survives (just like Eli) by making himself as unseen in his unhappy world as possible. Kare Hedebrant conveys all of these aspects of Oskar without a hint of self-consciousness. He is a terrific physical match for Oskar, too. He is pale to the point of invisibility, which suits his submerged personality. Watching Hedebrant come alive as Oskar once he falls for Eli, we can't help but pull for him, despite the odds. In Eli, Lindqvist has created a very different vampire. Eli's physical powers are imposing when seeking food but otherwise she appears to be almost underwhelming. She pretends to be stoically resigned to her condition, but she is not. After the first attack she breaks the victim's neck to prevent his transformation and then dissolves into tears while still sitting on his back. Eli has no desire to make anyone like her. Until she meets Oskar, Eli's life is simply a fight for survival. Even though Alfredson had her voice dubbed in by another actress Lina Leandersson is the one who brings the humanity to Eli. Her deeply expressive eyes register heartfelt affection and pathetic animal hunger with equal skill. She also carries off the paradox of being 12 psychologically while having had the experiences of someone much older. Together, Hedebrant and Leandersson achieve an amazing connection on screen. Theirs is essentially a pre-sexual relationship but they create a romantic intimacy that makes this a love story for the ages. It is a tribute to Alfredson's direction and these young actors that every one of their many scenes together rings utterly true. Unsurprisingly, Oskar and Eli's relationship highlight additional departures from horror film norms. In a typical vampire film an individual is singled out as the primary target of the monster. A good part of the tension in the story revolves around whether the vampire will succeed or be destroyed in this attempt to "take over" the human character. This dynamic is totally changed because Eli and Oskar come together from their mutual loneliness to save each other, both emotionally and in reality. And, in a subversive twist on formula, Alfredson gets us so invested in Oskar and Eli that we want them to be together, no matter what. When Lacke, a local man who lost his two closest friends to Eli, tries to kill her while she is sleeping, we fear for Eli. When Oskar warns Eli and she takes Lacke as another victim, we are relieved. By this point our sympathies have shifted completely. Lacke, who we would traditionally empathize with, becomes just another obstacle that must be overcome. Finally, the love story and the horror movie converge in a sequence that invites reflection on who is "normal' and who is the "monster". Shortly after Oskar has realized her secret Eli comes to Oskar's door but tells him that he must invite her in. Instead, Oskar rudely taunts her into coming in anyway. To Oskar's horror, blood begins to run from Eli's eyes, scalp, nose, and ears. In a panic, Oskar invites Eli in. With the fresh blood still filling her eyes and lining her face, Eli looks every bit the monster that Oskar has begun to fear. She angrily confronts Oskar with his wish to be able to kill his enemies for revenge while she kills only for survival. Then, sitting on Oskar's chest as she might do with a victim, she simply asks Oskar to, "be me for a little while". This stunningly poignant request echoes back through the history of horror film, to every monster who aroused our fears but also our compassion. In retrospect, it seems surprising that it took so long for someone to speak up. In Let the Right One In Tomas Alfredson has not only re-imagined the horror film, he has given us a work of art with an emotional richness that is seldom seen in any movie, regardless of genre. I consider it absolutely essential viewing. There is a little scandal associated with this movie. The English subtitles on the earliest releases of the DVD in the United States were for some unknown reason dumbed down. This led to changes from the theatrical version that really affect the tone and impact of several scenes in the movie. The good news is that so much pressure was exerted by fans that later issues have the original subtitles restored. The correct ones say "English Theatrical" on the back. Submitted by Ben R (not verified) on Thu, 2010-10-07 13:15. Very good! 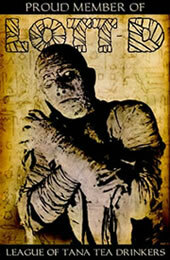 Has helped me a lot with my research of the film, and the horror genre. Submitted by Rich Dishman on Thu, 2010-10-07 15:00. Submitted by Bruce Jordan on Thu, 2010-10-07 19:11. Excellent review of one of the very few modern horror films that can truly be considered a classic. Great work, and I look forward to your next review! Submitted by Rich Dishman on Fri, 2010-10-08 07:22. Thanks for the kind comments. I see you have claimed The Living Dead at Manchester Morgue. I have never seen that one, but it has a lot of notoriety. I look forward to reading your assessment. Submitted by A. Nonny Mouse (not verified) on Sat, 2010-10-23 08:49. Great review of a great film. I think it's the best review of this that I've read so far and I've read quite a few. I was really impressed by this film and have been promoting it amongst my family and aquaintances and hence thru my six degrees hopefully. Related trivia: A Faberge egg sold for about $US18million in 2007 - not quite a nuclear power station but not too bad. Submitted by Rich Dishman on Sat, 2010-10-23 13:11. Thanks for the comments, they are appreciated. I think you may be right about Hakan's name only being used in the book. I will have to review the film to confirm that. Maybe I merged that info from the book inadvertantly. I had no idea what those "eggs" go for. Not too bad is right. Submitted by Nate Yapp on Sat, 2010-10-23 14:43. At the very least, the character is billed as Håkan in the credits.